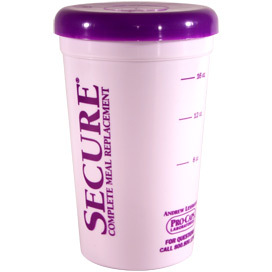 This lightweight and sturdy cup makes it easy to prepare and drink your Secure Complete Meal Replacement. 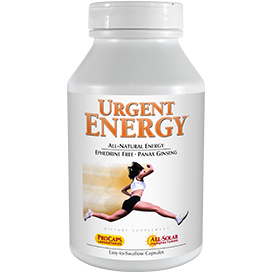 Now enjoying nutritious, low-calorie Secure is easier and more convenient than ever! Preparing your Secure Replacement Meal can be as easy as one - two - three. One - pour water, milk or juice up to the easy-to-read measuring line on your SECURE SHAKER CUP (8, 12 and 16 ounces are clearly marked) and add one or two scoops of Secure. Two - snap the no-spill, no-drip lid in place and shake for 30 seconds. Three - remove the lid and enjoy your delicious Secure meal or snack! The SECURE SHAKER CUP makes it easy to enjoy your favorite Secure flavor at home, in the office - even when traveling. It fits conveniently into a briefcase, shoulder bag or suitcase and is always ready to use. The lid snaps on and off easily so you never have to worry about cross-threading or whether the seal is tight enough. Four agitator blades inside the lid assure that your Secure shake is blended to creamy perfection. Made of lightweight, durable plastic, the SECURE SHAKER CUP is top-rack dishwasher-safe and will not fade so the markings will be easy to read throughout your weight-loss program. I love these cups... I did have one lid that cracked over time but the company sent me a new one. I use this at work. I add 8-12 oz of soy milk, and one scoop of secure. Then I put the cap on and I hold it on tightly as I shake the cup for a bit to mix it together (so I don't need a spoon). Then I drink it right out of the cup. Works great for me! I have several and I agree the lids probably aren't the best quality, but the cup is so cheap to buy... I love it! I love it is very good and easu to use shacer cup. I use every day whit no problem. I love these shaker cups. They work better than the shaker bottles that sell for a lot more money. The blender blades must work because I never experience a problem with clumping. I only wish the cup was clear so it would be easier to tell the amount of water you are adding. They also double as a fast, convenient way to mix eggs! If you currently drink the Secure meal replacement products, this shaker cup is a very convenient thing to have. I have 3 - one for home use, one for work which I keep in my desk, and one for travel. I honestly don't know if the four "agitator blades" on the inside of the lid actually do anything...but the cup/lid assembly works well and doesn't leak. I love this cup I have purchased several of them. I know have 5 cups but no lids. After awhile the lids get cracks in them and when you shake the cup it leaks out the cracks in the lid. So now I just use the cups to measure the milk and pour in the powder and then have to use a spoon to stir. Mixes better when shaked. Five stars for when I have a lid that works; 1 star because the lids break and are irreplaceable. Average = 3 stars. I have about 20 perfectly good cups with only 1 lid that hasn't cracked. I'm buying more now, just for the lids. I really don't need any more cups, but the ones I have are useless without the top pieces. Please, Andrew, can you make the lids available for separate purchase? You can charge $.50, or $.75 or I'd even pay the full $.90 - $.99 cents for them. It would be so much better for the environment. Thanks. These are nice cups. I've ordered several through the years. I, too, had trouble with the lids leaking after a while. I wish the cups were clear, though, so I could see the measurements better. Clear cups would be a nice improvement. Maybe you could sell additional lids separately. They would still be cheaper than what some other mixing cups sell for. These are nice, simple shaker cups but they do have a problem; the lids last only about 10 days before cracking and leaking. I've gone through 5 lids so far so I have a pretty good idea of how long they last. And I try to be as easy on them as possible. I like these shaker cups because they're so easy to use and clean. I just wish they'd make the lids a little stronger and charge a little more. Just noticed this mug on the site. I tried all of the Secure powders... & just stirred with a spoon. This shaker would have been much better had I known. Having bought these over the years I woulda thought the company woulda redesigned or improved the lids....the lids are secure, the price of the cup/lid is very reasonable (hence 2 stars not one) but the lids crack over a short time and you are left with a collection of plastic cups without lids. I see some reviewers note you cannot buy lids alone .......but even if you could, that’s not a good solution....they too will crack soon. Do love most of the company products but this one is a stinker. If, I was at work when I used this cup; I would of got the drink on me. It DOES leak. It is not a tight fix. I guess you get what you pay for.